It's important to remember that dogs view you as a large creature towering over them and the best way to avoid complications is to allow the dog to make the choice to approach you. Last month, I talked about how we can “listen” to our dogs more effectively by paying attention to their body language. But that begs the question: do they “listen” to us the same way? I’d like to offer a few tips on how to prevent that kind of misunderstanding when you’re interacting with dogs, especially those you don’t know. 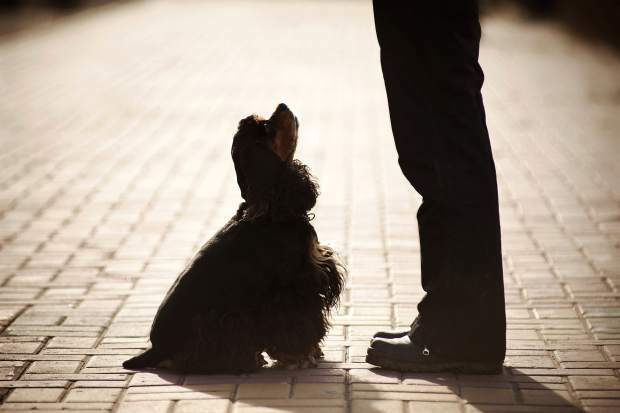 It’s particularly important to be aware of these unspoken body language signals whenever you’re dealing with dogs that are fearful, shy, or nervous. First, always let the dog come to you. No matter how big or intimidating a dog may appear to you, remember that to them, you’re this huge, looming creature they don’t know — which means that they might react negatively simply out of fear. Allow the dog to decide whether or not to approach you. And take some time: don’t expect a strange dog to instantly decide you’re okay, just because you know you’re a good person. Next, never stare directly at an unfamiliar dog. In the animal kingdom, direct eye contact is considered a threat, and the animal may well respond in kind. If you don’t know the dog, approach him with either soft eye contact (in other words, no staring) or no eye contact at all. We need to remember that while our culture sees direct eye contact as positive, that kind of action is alien to a dog’s nature. And while eye contact is a critical part of training your dog, there’s no way to know whether a strange dog has been taught to accept and adapt to human eye contact, so it’s best to err on the side of caution. And never put your face — or allow a child to put their face — directly in front of a dog’s face: that’s an excellent way to become a dog-bite victim. With any unfamiliar dog, avoid facing your body directly toward him. A nervous or frightened dog can interpret a direct, face-forward stance as being aggressive or confrontational, which can lead to major misunderstandings. Just turning your head to the side can help sooth an anxious dog. Dogs can also misinterpret someone bending over to pet them as threatening (again, especially if they’re fearful or nervous). This can be markedly true for small dogs, who can become extremely frightened when this giant human swoops down on them from above to pick them up or pet them. Instead, try kneeling sideways and keep your hands either close to your body, or offer an open hand low to the ground. And speaking of petting, sometimes our first instinct when we meet a dog is to pet or pat him on the top of his head. Unfortunately, dogs can see that as a threat if they don’t know you — and many dogs simply hate head-touching. A much better option is to offer an open hand, palm up, just below the dog’s chin, and let him reach forward to sniff. Then you can try scratching gently under his chin or behind his ear, and watch for his response. If he pulls away, stop trying to touch him. Once you’ve assured yourself that he’s relaxed, you can try resuming your petting. As humans, we crave contact, and most of us love to be hugged. But think how you’d feel if a complete stranger suddenly reached out and embraced you. Whether it’s your own dog or another, keep this in mind: if the dog leans into your hug with a relaxed body and soft expression, you’re fine. If, on the other hand, she ducks or cowers, looks away, or tenses up when you’re hugging her, it’s a strong signal that you’re making her anxious or uncomfortable. So, as important as it is to learn how to understand our dogs’ behavioral and body cues, we also need to remember that at the same time we’re “reading” them, they’re “reading” us — so be sure to use appropriate body language with the dogs you meet and greet. And you can help your own pooches survive in our human world by teaching them that stupid hominid behaviors like eye contact, head-petting, and hugging are good things, and may even get them a cookie.